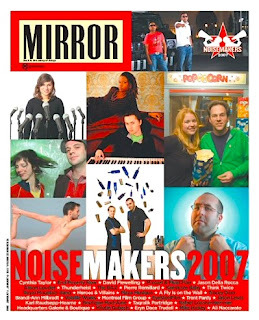 The Montreal Film Group which I co-run with writer and filmmaker Val Lonergan was honoured by being called a "Noisemaker of 2007" on the cover of this week's issue of the Montreal Mirror. The MFG brings together members of the Montreal film and TV community for networking events, workshops and parties. The group, started back in July 2004, had 50 members when we launched our website a year ago... we now have over 800 members. And yes, that is indeed a Scrabble 'E' pin on my green hemp hoody in the photo there. One point for noticing. Nice goin'! Do you work in film or TV? Consider joining the MFG. Can I get a bonus point for noticing (with a magnifying glass, I may add) that there's a stylized hemp leaf just to the right of the Scrabble E pin? You're absolutely right. It's there. But no bonus point. Sorry, Charlie.